Hilarious photos and simple, earnest text introduce us to the head of the henhouse: Tillie is a REAL chicken, and a very adventurous one, at that! Unlike the other hens at Little Pond Farm, Tillie isn't one to wait her turn to lay her eggs. And she's certainly not one to stay cooped up all day. Off she goes! 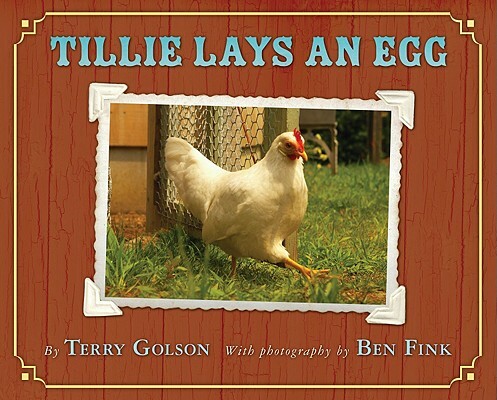 Author Terry Golson and photographer Ben Fink invite you to join Tillie on her first eggs-straordinary adventure. Come along as she explores the cozy world of Little Pond Farm -- and lays her eggs in the unlikeliest of places! Terry Blonder Golson is a renowned cookbook author and food columnist, and the very proud keeper of all of the hens featured in her book SNOWBALL LAYS AN EGG, as well as a rabbit and two dogs. She maintains this menagerie in Carlisle, Massachusetts with her husband and two sons, and broadcasts a live feed of all the activity in the henhouse via her website, www.hencam.com. SNOWBALL LAYS AN EGG is Terry Blonder Golson’s first book for children. Ben Fink is an esteemed photographer, whose work has appeared in numerous publications and galleries. He lives and works in New York. SNOWBALL LAYS AN EGG is Ben Fink’s first book for children. You can learn more about him and his work at his website: www.benfinkphoto.com.